Last week, Topps released their newest Baseball card set - 2013 Heritage Minor League Baseball. The set pays homage to the vintage 1964 Topps set by borrowing its design. 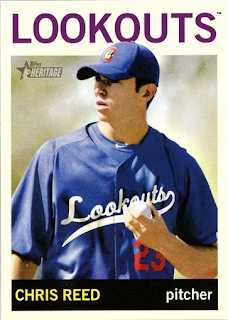 It also focuses solely on up-'n-coming stars within the Dodgers farm system. This set includes the normal cast and characters you would expect. You will find the fast rising infielder and younger brother to a current Major Leaguer Corey Seager with multiple different cards, and the impressive power-hitting outfielder Joc Pederson. One name I didn't recognize was catching prospect Gorman Erickson. He is card #3 below. 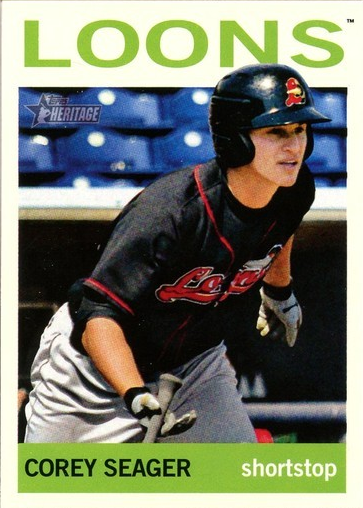 In fact, it appears that Topps didn't know much about him either. 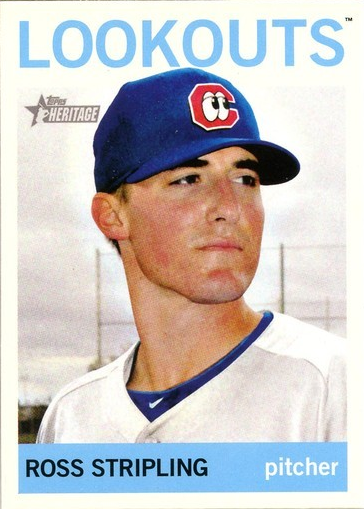 They indicate that he's a pitcher, when every record I could find shows him as a defense-first catcher. 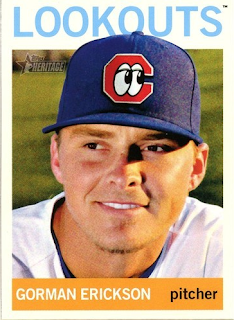 Of course, maybe Topps knows something nobody else does. Maybe the Dodgers should convert him, like they did with Kenley Jansen, into a hard throwing pitcher. After all, there is some precedent for that. 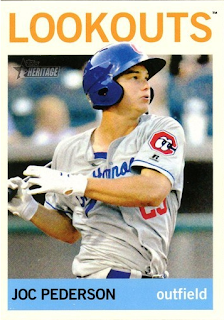 BTW, as you'll notice below Corey Seager has 2 different base cards in the set. 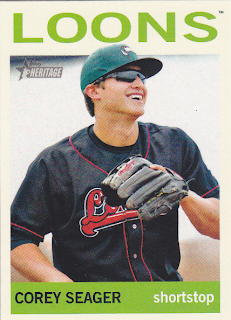 There is his normal card shown directly below, and a short-printed variation card of having fun while warming up at the very bottom of this post. I am unsure how scarce the variation card may be, so if your in the market I would suggest waiting a bit until adding it to your collection. Check out the Dodger prospect base cards below. Blog Kiosk 9/23/2013 - Dodgers Links - Vin Scully Way? 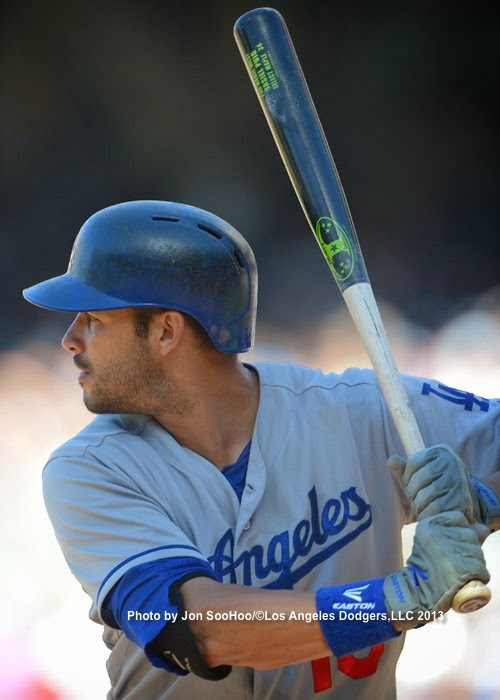 Andre Ethier pinch-hit on Sunday in San Diego. He struck out. The pic above is via Jon SooHoo/LA Dodgers 2013. "Vin Scully Way coming soon to Los Angeles?" Via KABC. "There's no honor that could be too great for Vin Scully, and I absolutely would love to rename a street for him. We'll look at a few around the stadium as a possibility," said Garcetti. "I know there's been a lot in the Twittersphere, a lot of people tweeting and Facebooking about this." The question that prompted the discussion came in from a viewer, who happens to be Scully's daughter-in-law, asking to change Stadium Way to Vin Scully Way. There was one Dodger not in Arizona when they clinched the Western Division, but he had a good excuse. 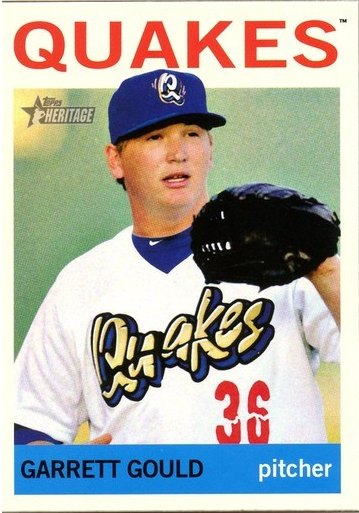 Reliever Chris Withrow was home in Texas for the birth of his first child. Congrats, Chris! Arash Markazi at ESPN has the story. Michael Young is eyeing retirement, via Ken Gurnick at MLB.com. "Brian Wilson signing working out well," via Mark Saxon at ESPN. "Dodgers' Kenley Jansen well-armed from both sides ," via Kevin Baxter at the LA Times. Jansen does everything left-handed, except throwing a Baseball. "When I was a kid I used to use a right-handed glove and I'd just put it on the other hand," says Jansen, who grew up in Curacao. "They almost started a fight with me. They said if I didn't stop doing that they would be beat me up." 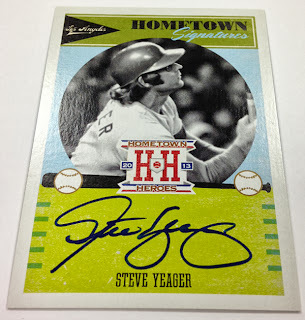 Panini shared a bunch of preview pic of some autographed cards from their upcoming 2013 Hometown Heroes Baseball card set. 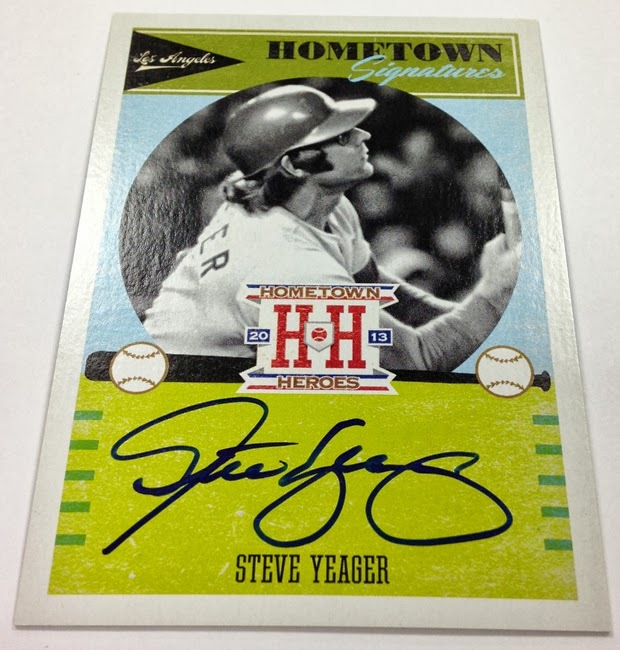 Check out the Steve Yeager card on the right. Rabbithole on Reddit shared a great aerial pic of the very first San Francisco home game between the Dodgers and Giants. Tony Jackson at Dodger Scribe notes that, "There is evidence Dodgers may be hitting their stride again". Here's an AJ Ellis song about Dingers - "The Wonderful Thing about Dingers".